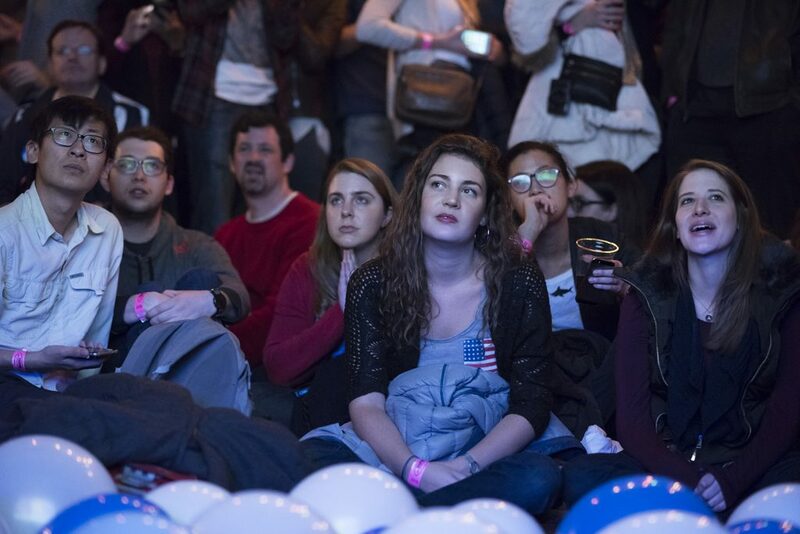 Hillary supporters carefully watch the poll numbers last night at the Middle East Restaurant and Nightclub in Cambridge. PHOTO BY LEXI PLINE/ DAILY FREE PRESS STAFF. “I look unto the sea of grey sky. The wind cries with every breeze. Heads hang heavy in sorrow. The chants of love smother the fires of hate. The ground is littered with fallen tears. Wails and sobs break the silence of this Fall day. The questions can only be heard as whispers. The United States of America has passed away at the age of 240. The nation of diversity and brotherhood is remembered through its loving citizens. America was born following a conflict with imperialist superpower. In 1776, its first words were a Declaration of Independence that established every person’s right to life, liberty and the pursuit of happiness. Over the following years the United States has had some problems, like most new nations. Internal conflict ravaged and divided it. But in the end, America came back together as a whole. America barely recovered from this shock but managed to stay together for almost 150 years. America was born a fighter and throughout its relatively short life, it got itself into a lot of conflicts that could have been avoided. Emotion often superseded logic. Lives were lost. The masses began to question America. In 2016, America was on its last legs. The rise of populist nationalism took the form of a businessman with a temper and fiery orange hair. He coaxed America into thinking it needed to be great again. Most Americans thought he was right, but some knew he was wrong. America was at its greatest but people could not see this. The great America the candidate wanted to return to never existed. It was a dream in an ignorant population’s head. Then Nov. 8 came around. America was nervous but still mildly calm, as the sea is before a hurricane. The votes came in. Every red state weakened America. By the end of the night, America had been laid to rest on its deathbed. By Nov. 9, America had passed away. America will be remembered by those who care. While this obituary is hyperbolic in nature, the America I grew up in has just been murdered. Hatred has replaced love. Ignorance is culturally acceptable. Morality has become a myth. While others have become passive, I refuse to let my America be forgotten. While I knew America had flaws, it was striving for equality and justice. It fought until the very end for those principles. America can rise from the ashes of this tragedy. These next four years will not be the America we open-minded citizens loved. But do not run away. Do not give up. We may have to fight for our rights but it will be a fight worth pursuing. We are America. After four years of horror, we will be able to make America great again.